With undeniable momentum, Design Centre, Chelsea Harbour champions the design world with its confident vision. For six days, London Design Week 2019’s dynamic programme offers the brightest and the best of world-class talent, making this celebration of the new season a remarkable source of inspiration, knowledge and expertise for both professionals and design-lovers alike. View the ultimate design collective from 600 international brands at 120 showrooms to discover defining design directions, designer collaborations and exquisite details close up. The latest glamorous looks at London Design Week 2019 capture a multi-layered vibrancy and cosmopolitan charm that underscore the importance of individual style and quality craftsmanship. Each is distinctive; what unites them is creative excellence. This year, a global outlook reflects the ability of showrooms at Design Centre, Chelsea Harbour to draw influence from around the world. Expect an abundance of patterns, shapes and colours in highly sophisticated combinations, noble materials and impeccable materials throughout. The curated programme at London Design Week 2019 offers more than 100 experiential sessions, plus ‘Legends’ imaginative window displays. In the showrooms, there are meet-the-designer sessions; launches; artisan demonstrations; Q&As and expert guidance, unseen anywhere else. On the main stage, Conversations in Design excels with an international line-up of high calibre speakers while Workshops and Design Discovery Tours expand on the show’s upbeat mood. At London Design Week 2019 take an inspiring journey into the minds of well-travelled influencers and tastemakers, gathered together at the world’s leading design destination. 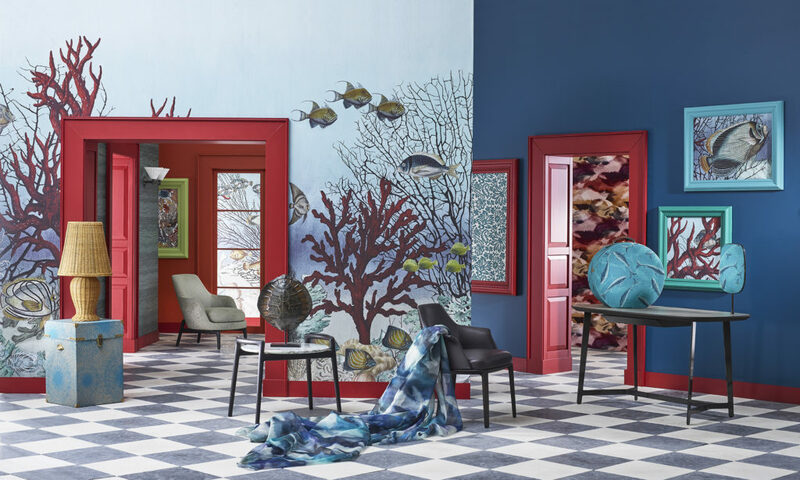 The return of ‘Legends’ at London Design Week 2019 sees showroom windows and showcases dressed in their finest, expressing all the sophisticated glamour of the prevailing mood in design. The initiative celebrates collaborations, and for many, inspiration is provided by the photographic archives of Iconic Images. Through the lens of international photographers, images featuring luminaries from fashion, rock, film and the arts are creatively matched. A roster of renowned interior designers includes Sophie Ashby who has been inspired by a bold portrait of Bianca Jagger for George Spencer Designs; Yabu Pushelberg is incorporating an image of film star Michael Caine at SA Baxter Foundry & Design Studio; Turner Pocock has looked to an alluring photograph of film star Ava Gardner for Tissus d’Hélène’s showcase; Phillip Jeffries is teaming up with Gunter & Co, while Henry Prideaux is partnering with Fox Linton, incorporating a stunning image of iconic model Twiggy. Arteriors, Decca and Perrin & Rowe have all chosen fashion images by legendary photographer Norman Parkinson, and de Le Cuona has selected a colourful image of Marilyn Monroe. Further collaborations include Alidad with Tim Page Carpets, Hirsch Bedner Associates with Decca and Interiorsetc with Nobilis. More show-stopping displays include those from Nina Campbell who is transforming her showroom into a decorated apartment and GP & J Baker who has teamed up with interior designer Ben Pentreath. More to be announced. Get behind the scenes and be inspired by the latest design directions in the international showrooms. Join co-owner Raffaele Fabrizio of Italy’s Dedar for insights into new designs at the intersection of design, art and fashion; Paris-based designer Bambi Sloane will discuss her new collaboration with Houlès, while master of digital patterns Kit Miles will be at Miles x Bookshop. Meet studio teams from global brands including Cole & Son, Style Library and Rubelli as they discuss the inspiration behind their new collections, or head to US firm Baker for an open house session with David Collins Studio. From France, expert archivists from Pierre Frey and Tassarini & Chatel at Lelièvre London will share their knowledge. There are talks on weaving at Sacco Carpets, events on curtain making at Beaufort Collection and eco-friendly design at Topfloor by Esti. Sessions on colour abound with events taking place at Holland & Sherry with Vero fabrics, Savoir with Insley & Nash, Victoria + Albert Baths with Sophie Robinson, as well as a colour forecasting talk at Romo. Artists in residence offer ‘live’ demonstrations of craftsmanship and skill at Oficina Inglesa Furniture, Porta Romana, Christopher Peacock and Jason D’Souza. Get hands on with Maya Romanoff at Altfield or hear more about mindfulness at Jensen Beds. At Espresso Design bestselling author and passionate cook Melissa Helmsley will demonstrate her new recipes. More to be announced.